How do I create an Reitmans online account? Please note that even if you have an existing VIP account in store, you still need to register to create an online account. Creating an online account will generate a new VIP account, but our system will automatically merge it with your existing account as long as you enter the same account information. If you create an online account using different information than was provided in the store, please contact Customer Care to have both accounts merged manually to be sure all your membership points are applied to the same account. How do I modify an existing online account? Select SIGN IN from the top of any reitmans.com page. At the bottom of any page on the reitmans.com website, enter your email address in the field below "WE TREAT OUR FRIENDS REALLY WELL". Enter the information requested and select SUBMIT or select CANCEL if you prefer not to enter the information. Select SIGN IN or REGISTER from the top of any reitmans.com page. Under the PERSONAL PROFILE, select YES next to "I would like to receive electronic messages (emails) from Reitmans…" and click APPLY. If you're creating an account, enter all of the required information and select YES next to "I would like to receive electronic messages (emails) from Reitmans…" Enter the additional optional information and select CREATE ACCOUNT. What are the benefits of signing up for Reitmans emails? Events and New Arrivals, Promotions, Sales, Contests, Giveaways, Featured Collections, Fashion Tips & Trends. 1. Should you no longer wish to receive marketing emails, you can unsubscribe by clicking "Unsubscribe" at the bottom of any of our emails. 2. After clicking "Unsubscribe" you will be forwarded to a webpage that will ask you to confirm the email address you are unsubscribing. You must click UNSUBSCRIBE to complete this process. Should you choose to unsubscribe from our marketing emails, you will still receive order-related emails, such as order confirmations and shipping confirmations. We may also contact you by email regarding any questions related to your order. Select SIGN IN at the top of any reitmans.com page. Under RETURNING CUSTOMER, select "FORGOT PASSWORD?" On the MY BAG page, verify that the products that you wish to purchase are displayed with the correct details (size and color) and price. If you have a Coupon Code, you can enter it in the field labeled ENTER PROMO CODE and select APPLY COUPON. The discount will display in red below the order subtotal. Once you're satisfied with the information in your bag, select PROCEED TO SECURE CHECKOUT or Check out with PayPal (If you select Check out with PayPal, you will be redirected to PayPal.com where you can Log In to your PayPal account or Pay with Credit Card or Visa Debit). If you are not already logged in to your Reitmans account, you will be directed to a page that will allow you to log in, create an account or checkout as a "Guest". Choose your preferred option and continue. Fill in all required information on the Info/Payment tab and select CONTINUE CHECKOUT. If you are logged in to your Reitmans account, you can select a pre-saved address from the drop down list if there is one associated to your account. If you forgot to enter your Coupon Code in the shopping bag, you can still enter it on the Info/Payment tab. Type in the Coupon Code in the Enter Your Coupon Code field below the Shipping Address and select APPLY. The coupon discount will display in red below the order subtotal. During the checkout process, you will be prompted to enter your billing address. The billing address can be different from the shipping address. However, your billing address must match the address associated with the credit card that you are using to complete your purchase. Can I purchase from reitmans.com and ship to the U.S.? You can make a purchase from reitmans.com to be shipped to a destination in the continental U.S. At this time, we do not ship to Puerto Rico, Guam, Hawaii, or Alaska. For further details, please consult Shipping Policy..
Can I place an order from reitmans.com if I reside outside of Canada or the Continental U.S.? Select Order Status at the bottom of any reitmans.com page. Reitmans Gift Cards are mailed to recipients by regular postal service at no charge. Note that for orders containing both merchandise and Reitmans Gift Card(s), the Gift Card(s) are shipped separately from the parcel containing merchandise. Which countries does reitmans.com ship to? Orders purchased by customers at reitmans.com, can be shipped to destinations within Canada and the continental U.S. At this time, we do not ship to Puerto Rico, Guam, Hawaii, or Alaska. For example, in the image below the Grey and Black are at the regular price of $15.00, while the Red is reduced to $4.80. When do I need to place my order if I wish to receive it before December 25th, 2018? Canadian orders (including gift cards) are to be submitted no later than December 14th, 2018 (11:59PM ET) to be received by December 24th, 2018. Are there any conditions that would prevent me from receiving my order on time if placed before December 14th, 2018? Be assured, that the necessary precautions will be taken to ensure that all orders completed prior to December 14, 2018 will be delivered by December 24, 2018. However, credit card authorization processes, erroneous shipping or billing information, rural or distant location deliveries and bad weather may cause shipping delays beyond our control. What are your shipping fees and services? Please note that Express Shipping is currently unavailable. Plastic gift cards are delivered separately from merchandise orders, typically within 4 to 9 business days using Standard Shipping, at no charge. Alternately, the Express Shipping option offers a 2 to 3 business day’s delivery and includes a tracking number for a rate of $15.99, before taxes. Visit the Gift Card F.A.Q. section for more details. Does your 30-day return policy change for the Holiday period? Yes, it does. Considering that many customers are buying gifts for their loved ones, we have extended the standard 30-day return period. Unworn, unwashed and unaltered items bought online or in-store as of November 4, 2018 may be returned or exchanged in-store with the original tag and receipt/gift receipt until January 13, 2019. Please note that due to the high volume of orders placed on Black Friday (November 23, 2018) and Boxing Day (December 26, 2018), we do not accept any returns, refunds or exchanges on those days. What is your in-store price adjustment policy? We offer a one-time price adjustment within 14 days of purchase on items purchased at regular price (without any discount, temporary or otherwise). To get your price adjustment, please contact us at 1-866-734-8626. Please note that price adjustments for online purchases will not be accepted in-store but online only. Price adjustments are NOT eligible on items purchased at a discounted price. What is your online price adjustment policy? We offer a one-time price adjustment within 14 days of purchase on items purchased at regular price (without any discount, temporary or otherwise). To get your price adjustment, please contact us at 1-866-388-4783. Note that price adjustments for merchandise purchased online can be received exclusively in this manner and cannot be received in-store. Price adjustments are NOT eligible on items purchased at a discounted price. Please note that due to the high volume of orders placed on Black Friday (November 23, 2018) and Boxing Day (December 26, 2018), price adjustments will not be permitted on those days both in stores and online. One or many items were cancelled from your order because they were no longer available at the time of processing. Note that your credit card will only be charged for items that have been shipped, even if cancelled items still appear on your invoice. For more details please Contact Us to reach an Reitmans Customer Care representative. Orders submitted on reitmans.com cannot be cancelled once they have been submitted. If you are unsatisfied with your purchase you may return it by mail or in any of our stores. More information is available in our Returns Policy. How do I enter a Coupon Code on reitmans.com? Type the Coupon Code (Example: EXCLUSIVE, FREESHIP) in the field labeled ENTER COUPON CODE located below the item list on the MY BAG page, and select APPLY COUPON. The discount will display in red below the order subtotal. If you forgot to enter your Coupon Code in the shopping bag, you can still enter it on the Info/Payment tab. Type in the Coupon Code in the Enter Your Coupon Code field below the Shipping Address and select APPLY. The coupon discount will display in red below the Total summary. You can complete the checkout process or continue shopping as the Coupon Code will be applied to items added to your cart before and after entering the Coupon Code. Please take note that coupons are often subject to restrictions. Please review the conditions carefully because only one coupon can be applied to an order at a time. You will be reimbursed on the same card with the description REITMANS HO CORRECTION MONTREAL QC. Processing time: 3-7 business days. Note: it could take up to 10 business days for your credit card company to apply the refund to your credit card account. Reitmans will offer a one-time price adjustment within 14 days of purchase on items purchased at regular price (without any discount, temporary or otherwise) when the original sales receipt is presented. 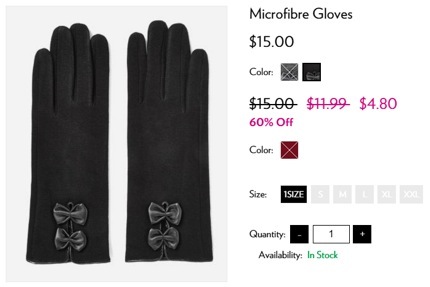 Price adjustments are NOT eligible on items purchased at a discounted price. Items purchased at Reitmans.com can be returned in-store at any Reitmans location or by mailing the items back to Reitmans, free of charge. Exchange requests can only be made in an Reitmans store. Exchanges by mail are not offered. Hyba purchases from reitmans.com can be returned either at a Reitmans or Hyba store or by mailing the purchase back to Reitmans, and returns are always free in Canada. Exchanges can only be done in a Hyba Movewear store. Within 30 days of purchase, you are welcome to return your unworn, unwashed, unaltered item(s) with the price ticket(s) still attached, to receive a full refund. Please note that refunds will be processed using the same payment method as for the original purchase. Purchases from reitmans.com can be returned in person to any Reitmans location or by mailing the purchase back to us using your free return label. Exchanges can only be done in an Reitmans store. We do not offer exchanges by mail. Returns of merchandise purchased with cash, credit or debit card without proof of purchase: you may return merchandise purchased with cash, credit or debit card; however, the return may only take the form of an exchange or a Gift Card. The amount of the return will be based on the lowest price of the merchandise within the previous two (2) weeks from the date the return is claimed. If such pricing information is not available because the merchandise returned is no longer in season, a Gift Card or exchange will be offered at the last selling price the merchandise was sold. Reitmans reserves the right to request valid identification prior to accepting merchandise for a return. Reitmans reserves the right to request valid identification prior to accepting merchandise for a return. Merchandise purchased in-store or online may be returned to any Reitmans store in Canada for a refund. To find a store near you, select Find a Store. Reitmans offers free shipping for items returned by mail in Canada. However we do not accept COD or collect deliveries. Reitmans does not offer free shipping for items returned by mail in the U.S. Within 30 days of purchase, you are welcome to return your unworn, unwashed, unaltered item(s) with the price ticket(s) still attached, to receive a full refund. Purchases from reitmans.com can be returned in person to any Reitmans location or by mailing the purchase back to us. Exchanges can only be done in a Reitmans store. We do not offer exchanges by mail. For full details on how to return your purchase, please read our Return Policy. Reitmans will offer a one-time price adjustment within 14 days of purchase on items purchased at regular price (without any discount, temporary or otherwise). To get your price adjustment, please contact us at 1-866-REITMAN (1-866-734-8626). Price adjustments are NOT eligible on items purchased at a discounted price. Note that price adjustments for merchandise purchased online can be received exclusively in this manner and cannot be received in-store. How do I return a U.S. order? U.S. residents who have purchased online from reitmans.com and aren't completely satisfied with their purchase, can mail the merchandise back to Reitmans for a full refund. Within 30 days of purchase, you are welcome to return your unworn, unwashed, unaltered item(s) with the price ticket(s) still attached, to receive a full refund. In the SEARCH box at the top right of any reitmans.com page, type in the article number, name or a word(s) associated with what you're looking for. If your initial search doesn't return the results you were looking for, try again. Your original search may have been too specific; using a more general term like "pants" or "skirts". Choose the size and color of the item you're looking for and select FIND IT IN STORE. You can either enter your postal code, or click LOCATE ME. 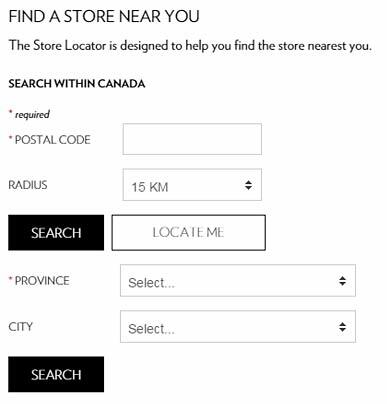 Select STORE LOCATOR from the top of any reitmans.com page. You will be automatically redirected to a web page that allows you to search by postal code or by city and province. Select Contact Us from the bottom of any reitmans.com page. Fill in the information on the Contact Us page and select SUBMIT. You will receive an email from the Reitmans Customer Care team, confirming receipt of your question/inquiry. Dial 1-866-REITMAN (1-866-734-8626) Monday to Friday from 9:00 AM to 8:00 PM EST and Saturday and Sunday from 9:00 AM to 4:00 PM EST. All our items are clearly marked Ultra Petite, Petite or Tall, either within the item’s online title, or on the item’s in-store tag. There are 3 types of charts: tops, bottoms and denim. When in doubt, take the time to measure your waist and leg length before referring to the chart on the item’s page. I was a Plus Size before. Where am I on the new chart? We combined all the size charts to be more inclusive; therefore,+ sizes no longer exist. For example, if you were a size 14 +, you are now a size 16 for bottoms and 34 for denim. Please note that you might not be able to find exact Plus Size equivalents within our new All Sizes chart, as we’ve recently reviewed our measurements and proportions. We recommend that you always consult the item’s chart on the product page. I’m Petite and I used to find the P sign really helpful to choose my clothes. Does it still exist or is there an equivalent? No, there is no equivalent in our new, simplified All Sizes charts. Generally speaking, if you were a 4 P, you are now simply a 4. However, this can vary for sizes 10 to 18 in bottoms. We recommend that you consult the equivalence size chart, as well as the item’s chart on the product page. What are the Ultra Petite, Petite, Woman and Tall inseams according to the pant type? Is there still a specific Petite and Plus Size chart for bottoms and denim? No, we decided to combine all our size charts to create a simplified all-inclusive chart for each of our categories: tops, bottoms and denim. We recommend that you consult the equivalence size chart, as well as the item’s chart on the product page.